A while back Outlier started making Strong Dungarees. They are a blend of a heavier version of Slim Dungarees and a work pant. 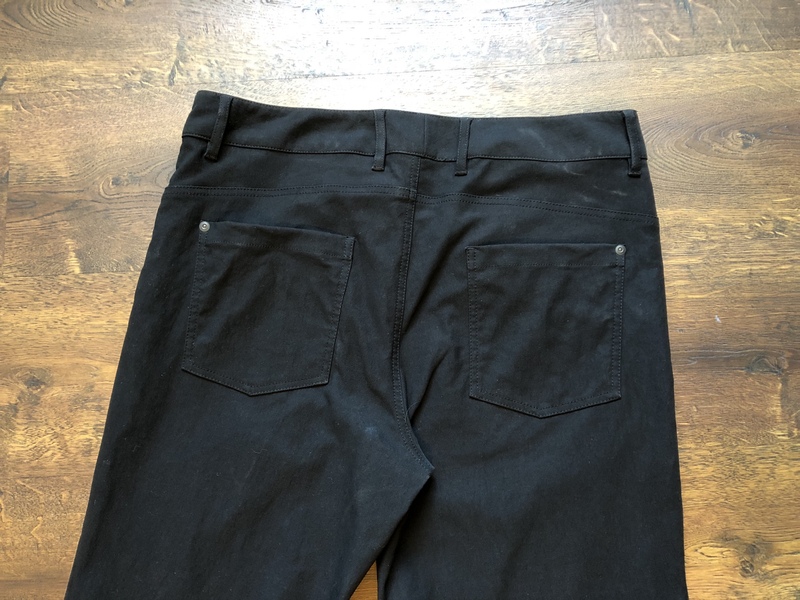 Essentially: these are a pair of pants that are insanely durable but still have a lot of benefits over standard work pants. 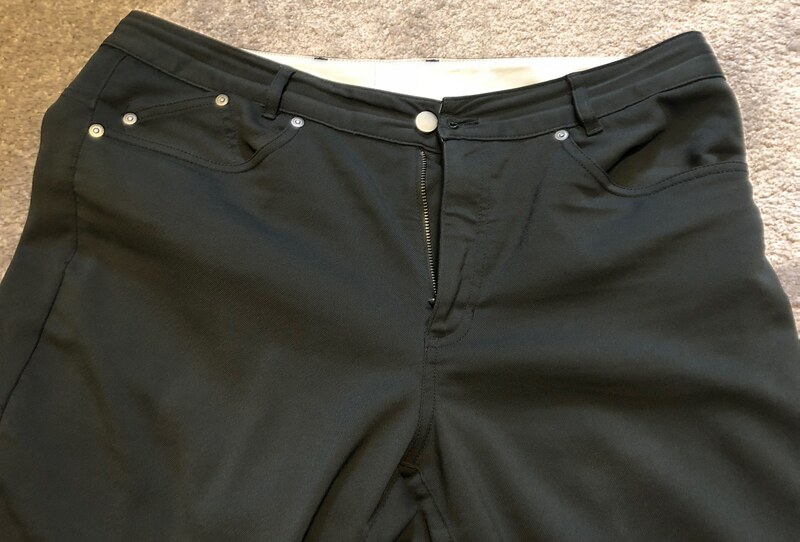 I’ve now owned two pairs of these pants, I can say that these are quite a good pair of pants, especially given that the fit is very different than that of the Slim Dunagrees (our review). Outlier makes these out of “Strongtwill” which is 96% Nylon, 4% Elastane coming in at 320 gsm. The texture itself is very much a twill texture, and is quite nice in person and for hand feel. Like the Slim Dungarees, there is no discernible stretch in these pants. I am sure it is there, but it’s not something you are going to notice. The material itself is very heavy, and very rugged feeling. Outlier says over time that these pants will break in and become softer and softer, while still being tough. I can see that, as I’ve seen that with other nylon products, but in the months I’ve had these pants they feel the same as the day they arrived. The nature of these pants lends them to cooler weather only. They don’t breathe quite as well as other Outlier pants, though they still dry fast, and they also help keep you warmer. Overall I would say you don’t want to go much above 75 °F in these pants. They start stiff, but Outlier notes they soften over time. I find them oddly comfortable. It’s hard to describe, but the stiffness doesn’t bother me at all, and the extra legroom affords plenty of movement. They aren’t comfortable in the same way as Climbers or Slim Dungarees, those are comfortable in the same way sweatpants or warm up pants are. Strong Dungarees are comfortable like your favorite pair of blue jeans. They feel truly indestructible, and honestly for most of life they might be. I hear they don’t handle wiping out from a skateboard on concrete, but fare better than jeans. That’s the only complaint about durability I’ve heard. Having spent time in the construction field wearing Carharrt pants, my gut tells me Strong Dungarees will last better than those. They look brand new, no matter what I seem to do to them. They only slightly soften when washing, so even the top load washer I have can’t beat them into submission. I’ve seen more than a few Redditors note that the fabric itself can grab leg hairs and pull them. This is understandably uncomfortable and a deal breaker for those who experience it. I’ve not noticed it at all, but the Outlier return policy is your friend in that situation. As you can see, the Black tends to pick up dust easily. That’s not wear on the pants. Perhaps the most amazing part of these pants is how they truly don’t look like a non-cotton material. They look downright normal and I don’t get to say that often. That alone should make them a no-brainer for anyone living away from the equator. They are neck and neck with the Slim Dungarees for my favorite Outlier pants. I’ve had the Strong Dungarees since they were released. 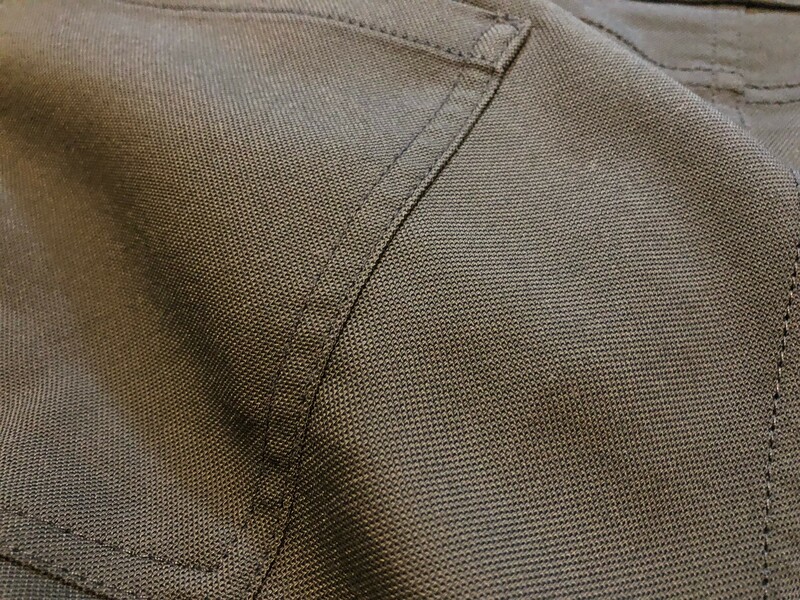 The Strongtwill fabric has a unique texture that lends to a nice feel and helps give the pants their stiffness. I think the look of the fabric, and the stacking it enables, allows these to pass as 100% non-technical pants. To me, they feel like a slightly less heavy pair of nice denim jeans — they feel soft but act strong. There’s no reason why these can’t replace your favorite pair of jeans. Outlier has been making their core shorts, the New Way Shorts (and New Way Longs) for a while now. 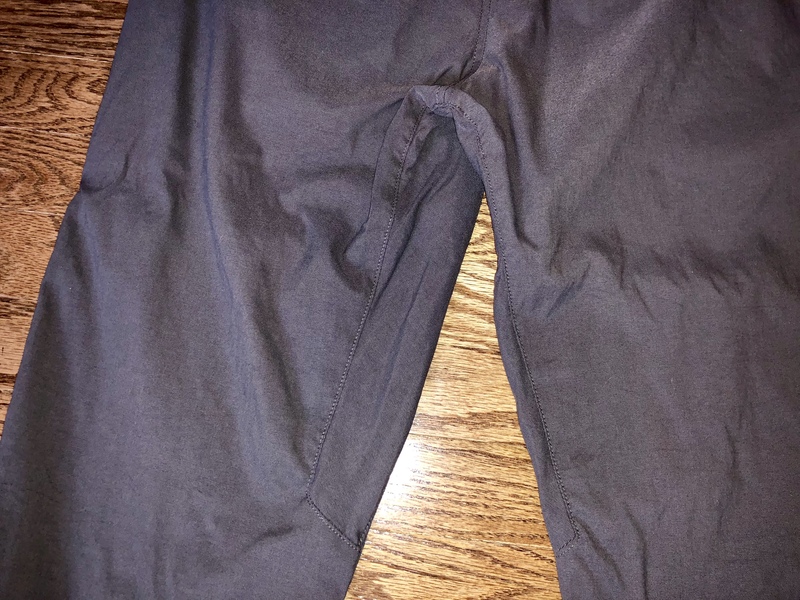 They are made out of the same fabric as the Futureworks (our review), my favorite business casual pants. 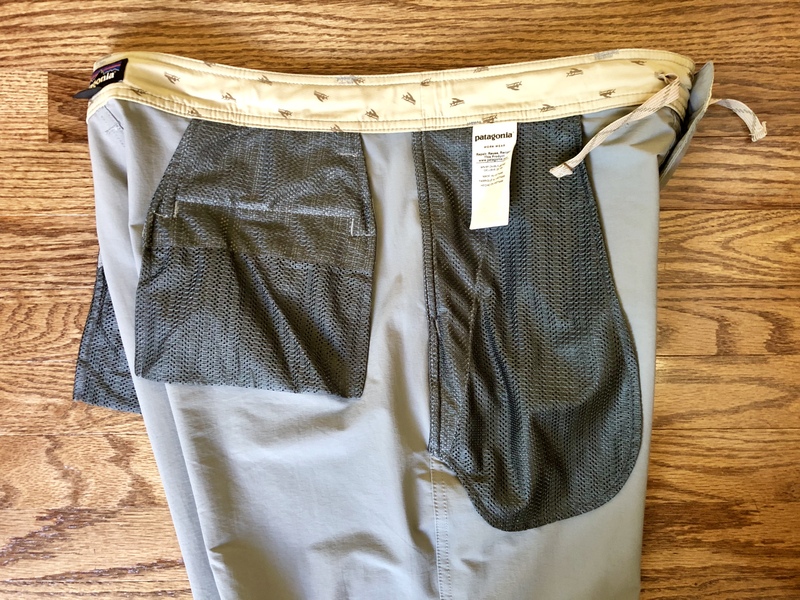 Outlier didn’t simply make short Futureworks, however, the New Ways are a different cut with other various features to allow them to be used as swim trunk as well. Outlier uses their F. Cloth, a 97% nylon, 3% elastane blend canvas. They claim a 35% two-way stretch, but like we’ve found the Strongtwill as well, the stretch isn’t noticeable. Since the fabric is made with air texturized nylon (Cordura grade), it has significantly less sheen than you might expect from a mostly nylon fabric. While it doesn’t look completely “normal”, it certainly doesn’t scream “technical”. The 200 gsm weight of the fabric makes it heavier than many performance shorts, but doesn’t detract from the performance at all. 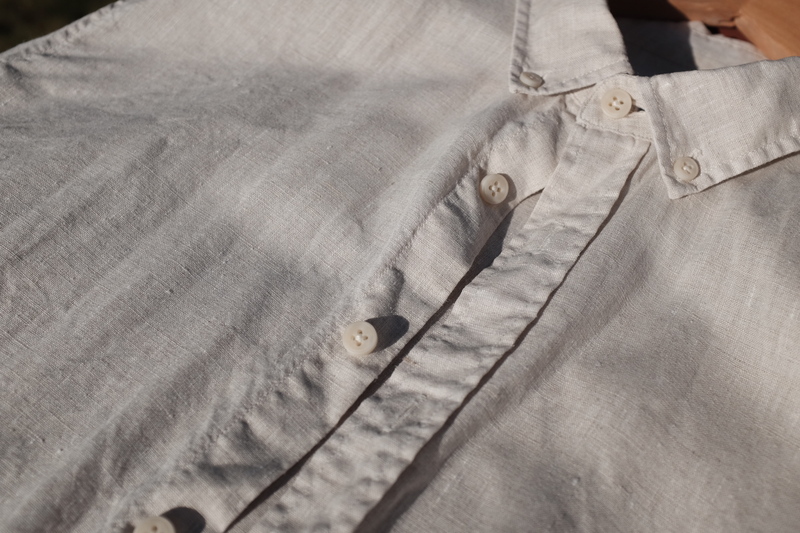 The F. Cloth fabric breathes well in any heat and dries quickly. 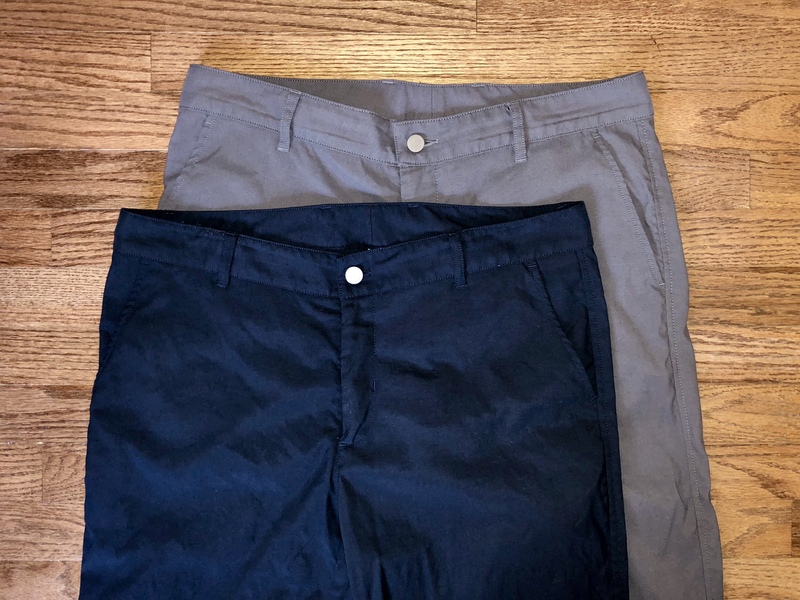 While the heavier fabric with non-obvious stretch may seem like it would make for a less comfortable short, the New Way Longs are my favorite short (the only difference between the New Ways and the Longs are the inseam — 8” vs. 11”). The combination between the slightly looser cut and the fabric helps them to move with your body. While they certainly could go for a hike, I prefer something with a more pronounced four-way stretch (and a shorter length) to make sure they really stay out of the way when I’m out on the trail. The F. Cloth and DWR treatment help these shorts stay dry, and when they do get wet, they dry quickly. The inclusion of a paracord drawstring (with excellent knots on the end) eliminates the need for a belt. This has become one of my favorite feature on any short, and are a must-have for me now. 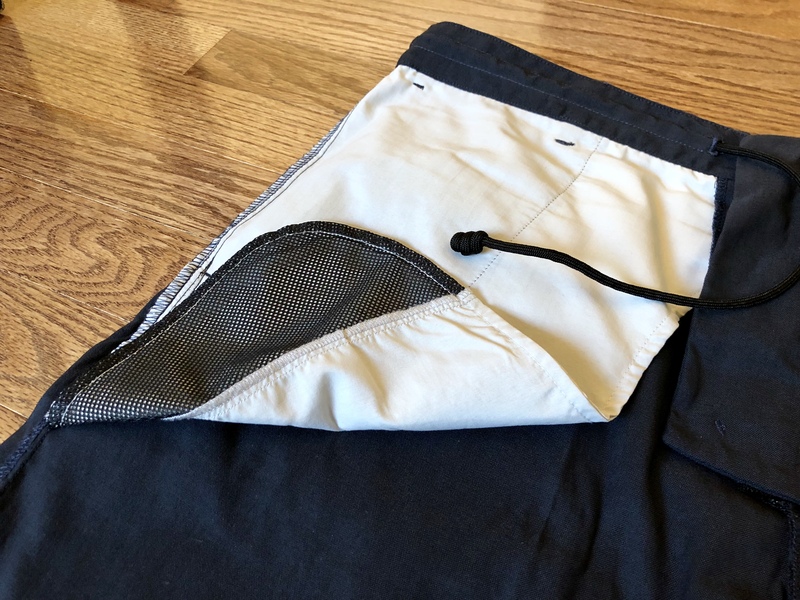 All the pockets have a flow through mesh at the bottom, greatly improving the shorts if you decide to get in the water (no more pockets full of water). The mesh seems just as sturdy as the pocketing material, so no need to worry about a key catching and making a hole. The front pockets are extra deep, so they do a great job keeping whatever you are carrying in place with no threat of sliding out. The only thing I find missing is at least one back pocket with a closure. Since the shorts target active wear, it would be nice to know that your wallet had a safe home. 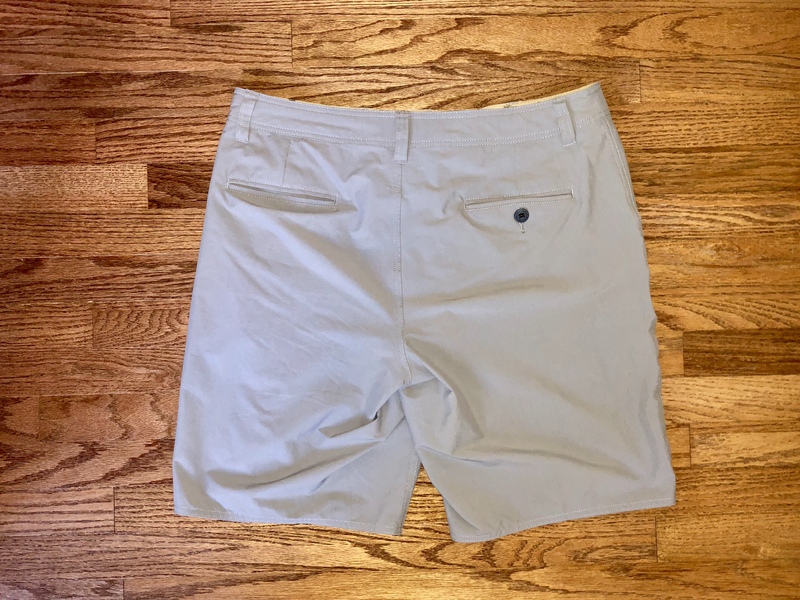 Since these shorts are tailored to fit like a dress pant, and have a proper button waistband and a working zipper fly, they fit any situation where shorts are appropriate. They could go from the beach to dinner. The nice custom made slot button attached with webbing adds a nice finish and Outlier touch. 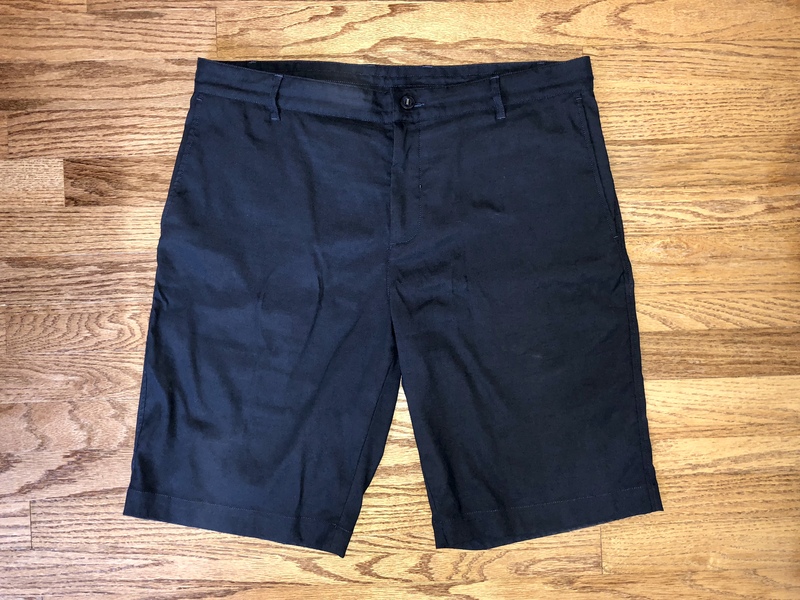 The Outlier New Way Shorts and New Way Longs are the best looking and most versatile shorts I’ve seen. With the two inseam options, everyone should be able to find the right fit. They look as close to “normal” as you will find and are cut like a chino short to fit into any situation. If you are looking for one pair of shorts to wear all summer, these are it. I’ve owned two pairs of these now (had to size down after losing weight) and they are amazing. I’ve swam with them in all sort of pools with no ill effects. They don’t dry as fast as proper swim trunks, but they can trim down your packing if swim trunks would be a maybe. I have the non-long version and I work out in them, hike in them, and they are generally my go to short whenever the weather permits. I agree with everything Steve says here, and for about 8 months they were actually the only shorts I owned. These are great. The Slim Dungarees are likely the most popular pants Outlier makes, as well as the pants that Outlier themselves consider their core pant. The description of these pants is: “A 21st century jean if you will.” Essentially it’s a ‘what would you make if you were to make jeans from scratch today’. There’s a ton of hype around these pants, with them winning awards every few months hailing them as the one pants to travel the world in. 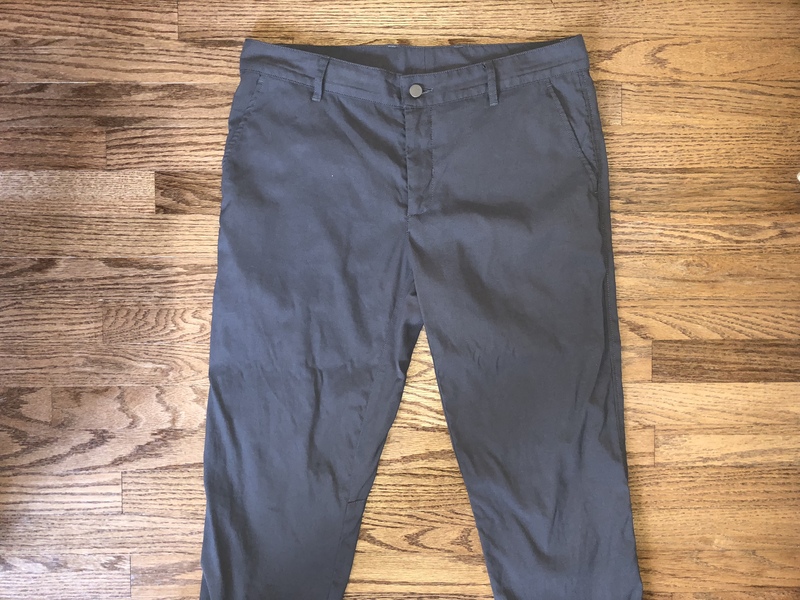 They are also among the most contentious pants Outlier makes, so let’s dive into them, as I’ve been testing them for well over a year. These are made from Outlier’s Workcloth Doubleweave Canvas which breaks down to: 82% Nylon, 16% Polyester, 2% Elastane. That’s only a portion of the story though, because these are not like any other technical material I’ve seen. At 275 gsm these are heavy pants, to me they feel on par with the weight of a standard pair of jeans. Outlier’s details about this fabric border on the absurd marketing level, but I have to say: they are pretty spot on. The exterior really does feel more like a broken in canvas. It has a great texture to it, which also helps to hide the fact that these are nylon pant. The texture makes them look more “jean like” than most other pants trying to replicate jeans. The interior almost feels fuzzy to the touch, without actually being fuzzy. Think of it like a glasses cleaning cloth — a stark difference from the outside of the material. There’s basically no stretch, despite there being an advertised “slight stretch”. I assume there is some, but practically speaking assume there is not. The material, more than anything, is what makes these pants — it’s a fantastic material and among my favorites that Outlier makes. Whew these are actually not very skin tight. What the heck, these are not very skin tight. Take your pick, but these are only slightly slimmer fitting that regular jeans — perhaps “tailored” would be better nomenclature for these. Do not let the name of these pants throw you off, they are not going to be super slim pants, but they also are not made to be baggy. Look at the pictures on the site, they represent the fit very well. Side note: Some might find that the thighs do not afford enough room. But the 45 day return policy should put you at ease with ordering these pants to try out the fit. You don’t read this site to find out about the cuts of garments, what you really want to know is how these pants perform. So to start, let me say that these are my preferred travel pants. If given the option to wear any pants on an airplane — no matter the flight length — these are the pants I pick. That’s the strongest endorsement I can give pants. There are a few factors in play here, so best to go through them one at a time. The mobility while wearing these is excellent, even though they lack stretch. The large gusset provides you with a pair of pants where you’ll never find yourself pulling up the legs slightly at the knee before you attempt a high step. They move exceedingly well, even though the materials alone wouldn’t seem like they would. On the warmth and breathability side I would peg these as: just as slightly cooler than jeans in cold weather, and much cooler than jeans in warm weather. In other words they breath really well. I’ve worn them in the snow without issue, and I’ve worn them in 80 °F weather as well. They were a bit chilly and a bit warm in both those situations, but jeans likely would be as well. They do breathe and they do dry very quickly despite their heavier weight. For a normal range of temperatures, these will likely be very good pants for you. Outlier also makes a lot of mention about the liquid staining resistance of these pants, and for good reason. The treatments on these pants is one of the key reasons to travel in them: you will be hard pressed to get them dirty. Water beads up and rolls off, same with coffee and soda. If something does manage to stick, a wet rag tends to get rid of it quickly and the spot dries in minutes. You can’t get ketchup on them and walk away unscathed, but for most of the little mishaps which happen in life, they come out clean. Overall, these perform at the top of the overall technical pants market, and is a leading factor in why people love them so much. There is one caveat to these pants which is often left out when talking about them. Outlier notes on their fit page: “When first tried on they should feel just a touch too snug. Over the first few hours or day they’ll loosen up, and when you put them on for day two they should fit perfect.” What that means practically is that they will feel tight when you first put them on, and then they stretch out to your body and fit very comfortably. I find that for me, this only takes a day when they are new, and a couple hours after they are washed. However, there’s a downside to this. If you spend a lot of time with the pants being stretched at the knees (e.g. kneeling, squat like positions, cramped into a tight space, crossing legs, etc), then the knees of the Slim Dungarees tend to bag out as well. This can create a very bad silhouette and is the one downside of these pants. When you wash and hang dry these pants, they go right back to form, so this isn’t something which is always going to be there. However, I can say that the typical reason I wash these pants is because the knees bag out, and not because the pants themselves are actually dirty. Then again, I know of many people who only wash these pants once or twice a year. Really depends on your body type and what activities you use these pants for. 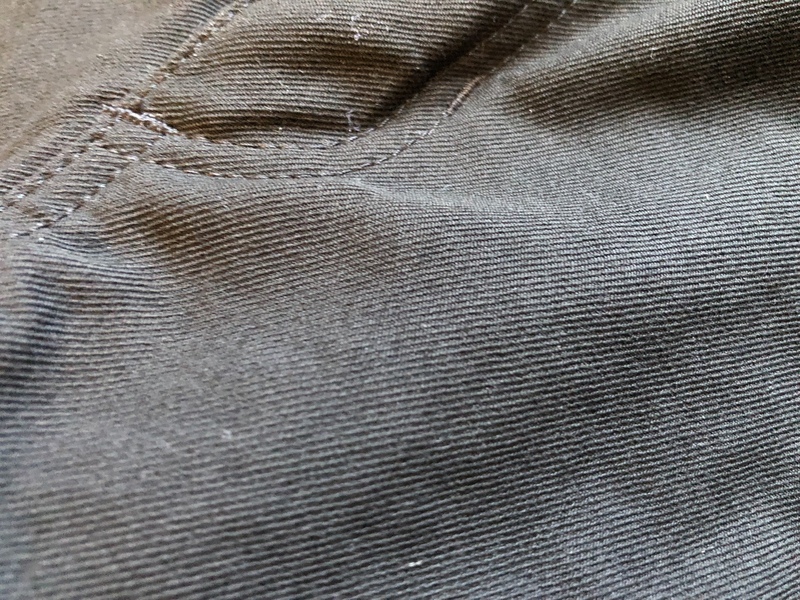 I tend to get 2-3 weeks of wear out of the pants before I start to think about washing them to get the knees back into shape, but that’s only with daily wear. At $198, many people will balk at thei price. You shouldn’t, these are hands down the best technical pants I’ve tried, and if I only could have one pair of pants, it would be these. For the temperate weather of the Pacific Northwest they are the perfect weight, and the water repellency means no more wet thighs when you walk in from the rain. I highly recommend these pants. Personally I have owed: Gray Shadow, Charcoal, Dark Indigo, and Concrete colors in Slim Dungarees. I currently own the Gray Shadow. Most people say that if you want to replicate blue jeans, to get Dark Indigo. I personally disagree as they were my least favorite color I owned. Charcoal is a great color, and might be the most versatile, followed by black. I know, black, but if you listen to the people buying Outlier, they say it is the best color. Gray Shadow is interesting, but I don’t think I would buy it again. It’s a nice color, but Charcoal was more versatile as it has less tint to the gray. Occasionally, Outlier stocks these in Sandstorm, which is a very nice khaki color. I originally resisted getting a pair of Slim Dungarees because I thought they would be too tight in the thigh and I thought I would need the Long length. At some point after I got my Futureworks (our review), Ben convinced me to try the Slim Dungarees. When I tried the same size as my Futureworks, the thighs were a little too slim for me. Between that and the fact that I was going to have to get them tailored, I returned them. Recently, Outlier had a few colors on sale (in the regular length) so I grabbed one size up in Grey Shadow. Surprisingly, the length worked, even though it’s listed as an inch shorter than the Futureworks. I usually wear these with boots, but the length even looks fine with sneakers. They also fit me in the thigh, even though the listed measurement is still smaller than my Futureworks. My only guess is that the different cut causes the pants to sit differently, making the sizing work. I’ve been impressed with the pants so far, and find them to feel like they have a lot more stretch than they actually do. These are my most comfortable pants and are almost as comfortable as sweatpants (while looking much better). The Patagonia Stretch Wavefarer Walk Shorts are a casual, “do anything” pair of shorts. These shorts have similar features to the Baggies Longs (our review) but are much less casual. I’ve worn these shorts for everything from around the house, to hiking, and out to a casual lunch. These shorts are made from a 96% nylon (62% recycled)/4% spandex blend with 4-way stretch, a DWR finish, and a 50+ UPF sun protection rating. The 4-way stretch makes sure the fabric never gets in your way (even with their slightly longer length), and the combination of the DWR and nylon content help keep the shorts from getting wet, and when they do get wet, helps them to dry quickly. There is some “nylon” noise with these shorts, so they won’t completely blend in. While they are advertised as 20” (outseam), the inseam is about 9.5”. Being chino-styled, these shorts come in the usual even numbered inch waist sizes. For me, they fit true to size. The internal drawstring is a very nice feature and something that I look for on any short I buy now. It allows you to wear the shorts without a belt, even without an exact fit (or if your pockets are loaded down). The fit of the shorts is standard, not too baggy or slim. They fit in most anywhere shorts are acceptable. 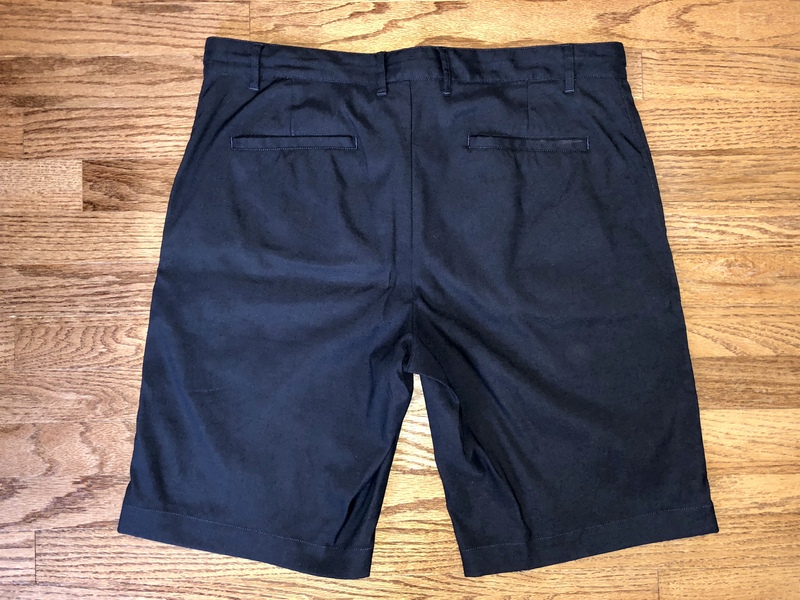 Although I wouldn’t wear them for all occasions (that’s where the OUTLIER New Way Longs come in for me), at about half the price, they are a step up from many other performance shorts. The chino styling helps step up the looks a bit, but the slightly wrinkly and noisy fabric (and the embroidered “Patagonia” on the leg) detract some. Even just the removal of the embroidery would improve the look. There are two front slash pockets and two back pockets with mesh linings (for easy drainage). 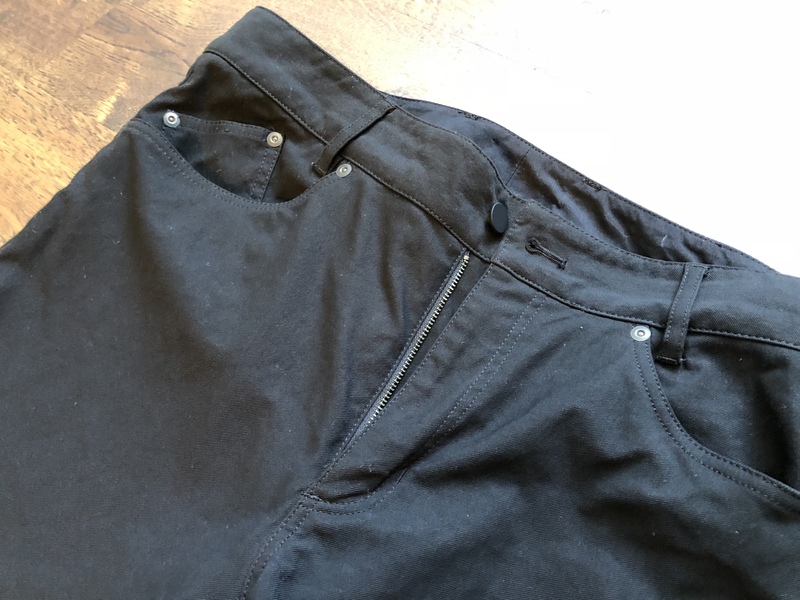 The right back pocket has a button closure (with lay-flat webbing, the same as is used on the top button) and an elastic key loop. 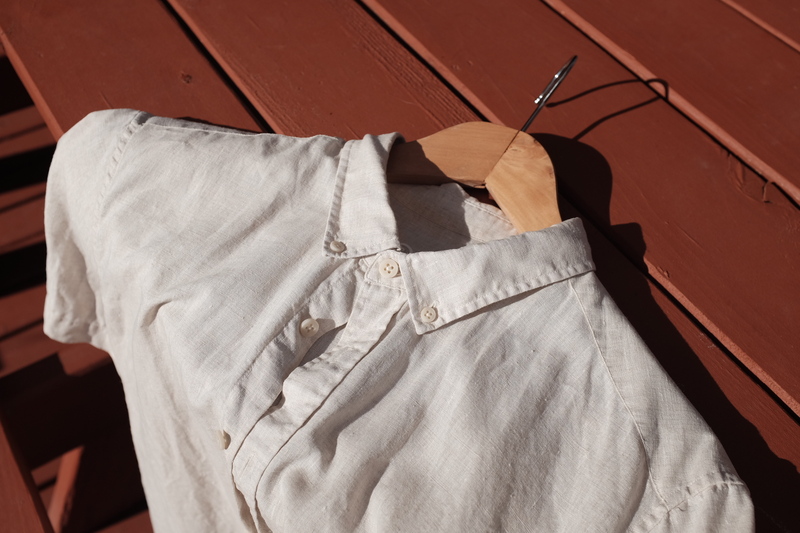 The key loop is on the center side of the pocket, so it is not comfortable to use for a set of keys. It seems to be designed to loop around a single house style key. 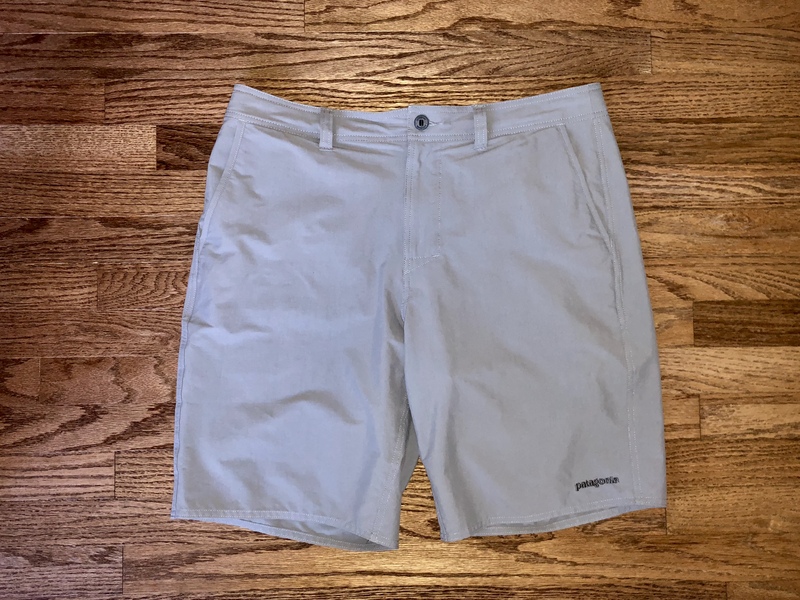 While I think the Patagonia Baggies are more suited as a short/swim trunk hybrid, these will do in a pinch if you weren’t expecting to get in the water (without looking too casual). The Patagonia Stretch Wavefarer Walk Shorts are a great value if you are looking for a casual, chino-styled short. While they aren’t quite a do-everything short like the OUTLIER New Ways, they are a solid choice. It’s not a secret that we are big fans of Outlier here at Everyday Wear. The Futureworks are our go-to business casual pants and are a great place to start with Outlier. The Futureworks are made with Outlier’s F. Cloth, a 200 gsm 97% nylon, 3% elastane canvas with 35% two-way stretch and a DWR coating. The nylon is a Cordura grade nylon 6,6 that is air texturized, this means it is softer, stronger, and most importantly, more matte than what you’d expect from the usual nylon. While the stretch isn’t as noticeable as you’d expect from the claim of 35% two-way stretch (this means the stretch is only in one direction across the fabric, rather than both as in four-way stretch), I’ve found the Futureworks to be very comfortable due to the addition of a knee-length gusset. These move better than a standard pair of cotton chinos, but I wouldn’t want to wear them where I needed extreme motion constantly (that’s what the Slim Dungarees are for). The fabric is lightweight enough to remain comfortable in hot and humid weather, but can still be OK in the winter when outside for a quick walk or back and forth to your car (or comfortable in any cold with a baselayer). The DWR does an excellent job of shedding a light rain (or a spilled drink). Also, since the fabric contains no polyester, there are no static issues in the winter. 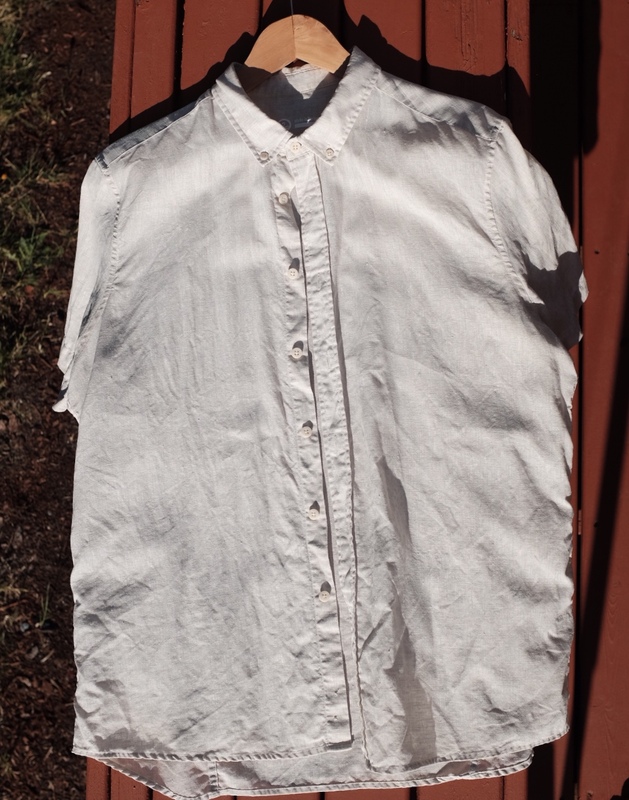 The fabric dries extremely fast — when they come out of the washer they are almost dry and will be completely dry in a few hours. However, they can look quite wrinkly when they dry. Since you can’t iron synthetics, the wrinkles will work their way out from your body heat when you put the pants on. Or, while I haven’t machine dried mine (which is allowed per the care instructions), I imagine a few minutes on low would also take care of the wrinkles. 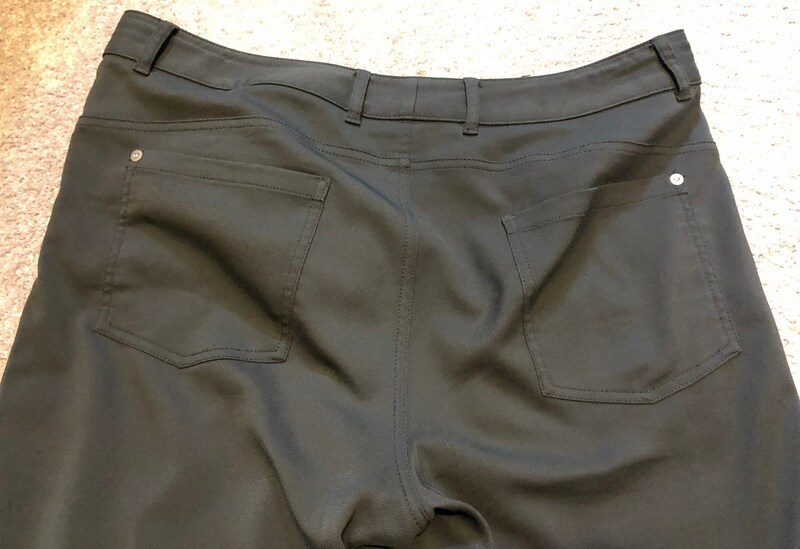 These are the most normal looking performance (non-cotton) chinos I have found. While no synthetic pant will ever look like its cotton counterpart, the Futureworks get pretty close. The only giveaways from afar are the slight sheen and slightly stiff drape. I think Outlier has done a great job cutting down on the sheen, but there is always is room for improvement. When you take closer look, the texture is also different from cotton. The Futureworks have a great “straight” fit. They are looser than the Slim Dungarees, especially in the thigh. This gives the sizing an ability to work for more people. I think the fit works perfectly for a business casual look, however, there are a few adjustments I’d make. Outlier only offers one inseam (33.5”) which is just long enough for me. So if you are tall, you may be out of luck. For me, the only fit issue I have is a slight gap at the back of the waistband. This could probably be solved with a higher rise. If you are looking for a performance pant to replace your chinos, look no further than the Outlier Futureworks. I think they provide a great value at $140. As a core Outlier item, they are usually well stocked in many color options (I own the Phantom Grey and Dark Navy) and the return policy makes it easy to give them a try if you are on the fence. 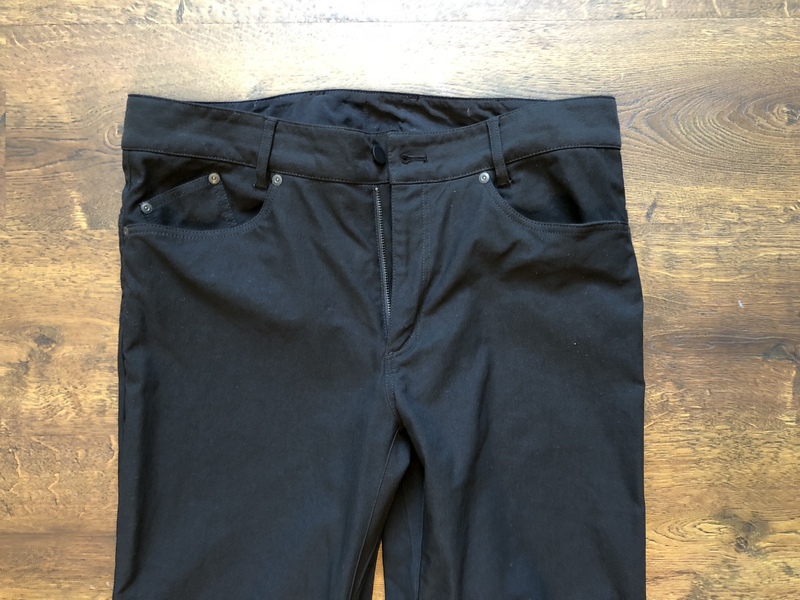 The Futureworks are the first pair of Outlier pants I owned, and since I’ve been losing weight I have had the chance to own three different pairs. They are fantastic, and the Sandstorm color is the best khaki pant option you can get. I love these for flying, as they stay clean and look sharp even after six hours on a plane. These are perhaps the most underrated item Outlier makes and likely the first you should pick up. I’ve owned both the Dark Navy and Sandstorm, and both are excellent. I’ve never had anyone comment that my pants look odd with these, or ask about them. They are stealth. They make no more noise than a standard cotton pant and perform leaps and bounds better. GORUCK is having their X-Mas in July sale. Many of our favorite clothing pieces and a few bags are on sale (in select colors). If you’ve been thinking about making a purchase, now’s the time.